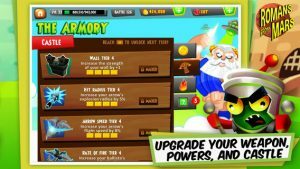 Romans From Mars iPhone Game Review: Out of This World Fun! 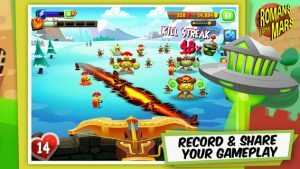 Romans From Mars is an iPhone game developed byMajesco Entertainment. In this awesome mash-up of Roman history and sci-fi, you must battle wave after wave of deadly Martian invaders! 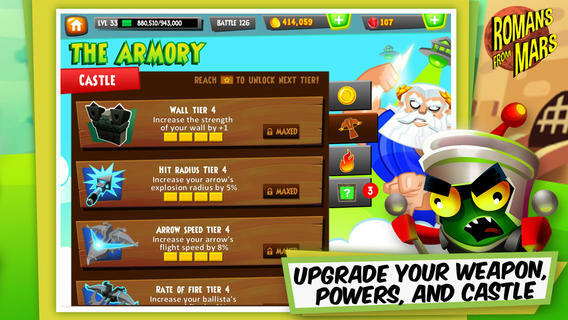 In Romands From Mars, you play as a Roman centurion with exceptional weapons skills. 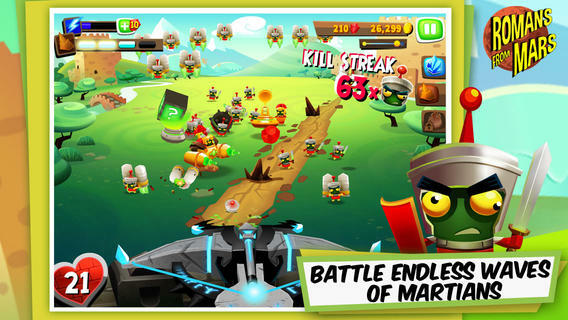 When aliens from Mars appear, you need to battle these dastardly invaders. The Martians, not surprisingly, are being commanded by Mars (the Roman god of war.) You, on the other hand, are fighting on behalf of Jupiter, king of the gods. Jupiter has given you a pretty sweet arsenal of weapons. The weapons here in this siege warfare game have a decidedly elemental feel about them, with powers like Fire, Ice, Earth, and Lightning at your disposal. In addition to the awesome variety of weaponry at your disposal, there are also 10 different types of alien enemies to crush. There are also 30 achievements to unlock, ensuring tons of replay value. The graphics in Romans From Mars are absolutely top notch, with fun character designs and awesome weapons effects. Unfortunately, a lot of people online have been complaining about the game’s tendency to crash on start-up. However, it seems like the recent updates and bug fixes have dealt with this issue for the most part. I personally didn’t experience any crashes. 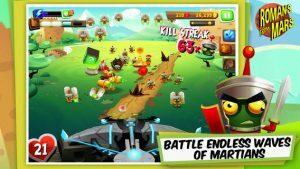 Overall, Romans From Mars has a really intuitive interface, a unique look, and addictive gameplay. I also loved that you can record and share your gameplay! 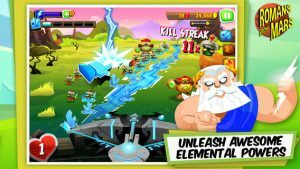 If you love battling endless waves of alien enemies, this unique mobile gaming title is definitely worth checking out! Majesco Entertainment has done a number of great titles lately, and Romans From Mars is one of their best games yet! Romans From Marsrequires iOS 6.0 or later. Compatible with iPhone 4, iPhone 4S, iPhone 5, iPhone 5c, iPhone 5s, iPad, and iPod touch. This app is optimized for iPhone 5.